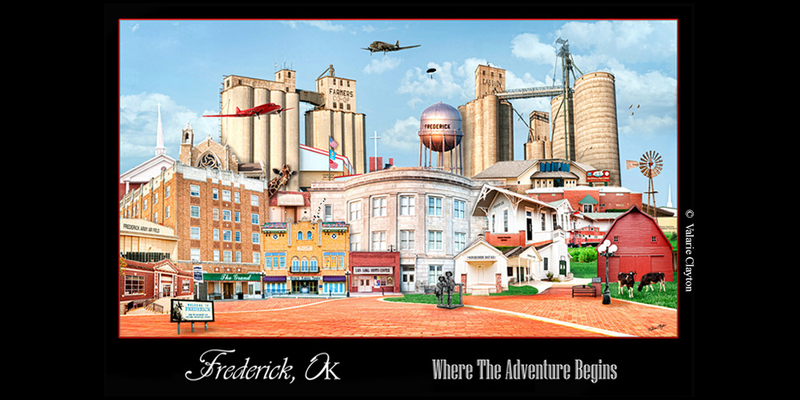 We are ready for Freewheelers to arrive in FREDERICK, OKLAHOMA on Sunday, June 7th!! That afternoon will be filled with all sorts of entertainment that everyone can enjoy. At 3:30 p.m. there will be an Abernathy Day/Freewheel Parade in downtown Frederick. We will have vintage automobiles, children with stick horses, motorcyclists, horses and bikes! After the parade the courthouse square will be alive with classic cars, Freewheel campers and Indian Motorcycle rides! Later that afternoon we can expect a good old fashioned Abernathy dinner at the Townsite Museum as well as unique entertainment featuring Abernathy Storytellers and Native American Dancers. Because this event will take place on a Sunday, the Frederick Chamber will be printing a map of local businesses and special hours/services for this day. These information sheets will be around town and at the link below. Other open attractions include: The Pioneer Townsite Museum from 10am- 7pm, The Crawford Collection from 1pm- 5pm, and the Ramona Theatre from 1pm-3:30pm showing “The Remarkable Ride of the Abernathy Boys” continuously. Frederick has decorated their downtown area and everyone is beyond excited to greet our visitors this Sunday! Feel free to cruise our Freewheel page on our website or contact the Chamber office at 580-335-2126 more information!